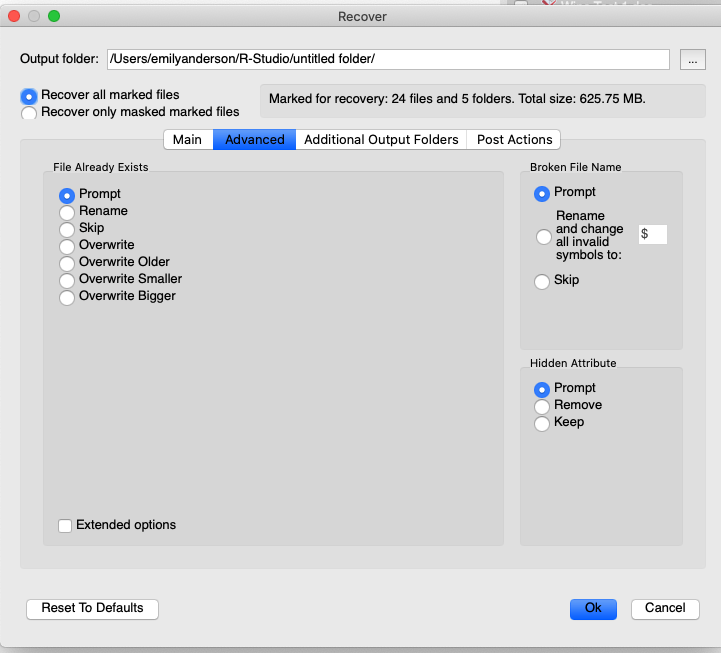 If R-Studio while recovering files encounters either an already existing file or file with a broken name, normally it will stop working and ask you what to do with the file. If you recover multiple files, that may require you answer a lot of the same questions. 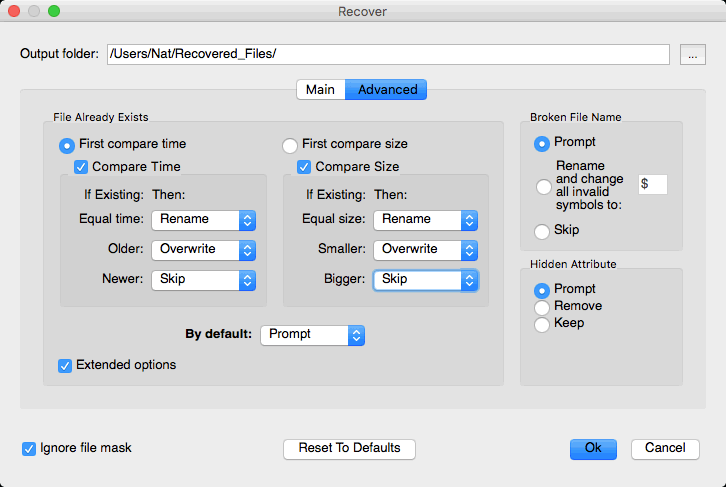 You may use Mass File Recovery Options on the Recover dialog box to instruct R-Studio what to do in those cases for all files. These options instruct R-Studio what to do if there already exists a file with the same name. If this option is selected, R-Studio asks the user what to do for each such file. It stops file recovery until it receives the answer. If this option is selected, R-Studio adds a File ID to the file name. If a file already exists with the same name and that file ID, a number will be added to th file name and file ID. If this option is selected, R-Studio skips all new files with the same name. If this option is selected, R-Studio overwrites the existing file with the new one. If this option is selected, R-Studio overwrites the existing file with the new one if the existing file is older than the new file. The time stamp used is Modified. If this option is selected, R-Studio overwrites the existing file with the new one if the existing file is smaller than the new file. The time stamp used is Modified. If this option is selected, R-Studio overwrites the existing file with the new one if the existing file is bigger than the new file. The time stamp used is Modified. These options instruct R-Studio what to do if a file to be recovered appears to have an invalid name. If this option is selected, R-Studio shows the standard Broken File Name dialog box for each file with a broken file name. It stops file recovery until it receives the answer. If this option is selected, R-Studio changes all invalid characters to the character specified. If this option is selected, R-Studio skips all files with broken file names. These options instruct R-Studio what to do if a file to be recovered appears to have the Hidden attribute. If this option is selected, R-Studio asks the user what to do with the attribute . It stops file recovery until it receives the answer. If this option is selected, R-Studio removes the Hidden attribute from all files. If this option is selected, R-Studio keeps the Hidden attribute for all files. These options give you more flexible ways to process multiple files with the same name. You may compare files by time (Modified) and size, and decide what R-Studio should do with those duplicates. If any of the files has an invalid time, the comparison by time is skipped. In this case, if comparison by size is not active, R-Studio goes to the default action.. These options instruct R-Studio which condition to use first, file time or size. These options instruct R-Studio to enable comparison by time and size.. These selectable actions instruct R-Studio what to do if the condition is met. If this option is selected, R-Studio skips the condition. If the Modified time stamp is invalid, R-Studio will skip the comparison. The action R-Studio takes when none of the comparison conditions have been met. That may happen when the comparison by size is not enabled.